Jeff Rapsis / Silent Film Music: Tonight: 'Mystery of the Eiffel Tower' (1927) at Aeronaut Brewing Co. in Somerville, Mass. at Aeronaut Brewing Co. in Somerville, Mass. A scene from the climax of 'The Mystery of the Eiffel Tower. Yes, on this day in 1889, Gustav Eiffel's eponymous tower was declared open to the public! And what better way to celebrate the 130th birthday of this iconic landmark than with a movie that features it in a starring role? "Mr. Eiffel, I'm ready for my close-up!" So that's what we'll do tonight at 7:30 p.m., when we'll screen 'The Mystery of the Eiffel Tower' (1927) at the Aeronaut Brewing Co., 14 Tyler St. in Somerville, Mass. Admission to this event, the first "volume" of the Aeronaut's new Silent Film Club, is $10 per person. More info about this remarkable early thriller is in the press release tacked onto the end of this post. Hope to see you there! For now, let me share a few pictures of Friday's night's excursion to Winchester, N.H., where I accompanied a screening of Harold Lloyd's 'Safety Last' (1923) sponsored by the local Grange chapter and the historical society. The venue was Winchester Town Hall, which is a surprisingly imposing structure built in the style of a Gothic fortress. Set-up was fairly straightforward, with the local folks providing a snazzy movie screen cleverly engineered out of a Queen-sized sheet from Wal-Mart. I improvise the music, so why not improvise the screen? But the good news was that even with just a handful of people, Harold's work produced a good amount of strong laughter. That's quite an achievement for a film made nearly a century ago! And I had to be careful with the music, because the Winchester Town Hall is one of those venues with extremely lively acoustics. It would be really easy for music to overwhelm the comedy, which in turn would prevent people from hearing each other laughing. But a good time was had by all, and I hope that will be the case with 'The Mystery of the Eiffel Tower' down at the Aeronaut Brewing Co. this evening. Here's the press release. Hope to see you there! Celebrate 'Eiffel Tower Day' on Sunday, March 31 at Aeronaut Brewing Co.
SOMERVILLE, Mass.—When you turn 130, it's time to party. That's the thinking behind 'Eiffel Tower Day,' celebrated every year on March 31 in honor of the iconic Paris structure, which was completed on March 31, 1889. The Aeronaut Brewing Co. will celebrate this year's 'Eiffel Tower Day' on Sunday, March 31 with the screening of a rare silent adventure movie with a thrilling climax actually filmed on the tower. 'The Mystery of the Eiffel Tower' (1927), directed by Julien Duvivier, will be screened on Sunday, March 31 at 7:30 p.m. at the Aeronaut Brewing Co., 14 Tyler St. (near Union Square), Somerville, Mass. The screening will feature live musical accompaniment by Jeff Rapsis, a New Hampshire-based silent film musician. Duvivier’s late-silent adventure served as an inspiration for the original Tintin comics, and delivers much of the same charm, inventiveness, and visual delight. Set in France of the 1920s, 'The Mystery of the Eiffel Tower' follows a carnival performer who is half of The Mironton Brothers, a supposed Siamese twin act. The performer sees a chance to claim a massive inheritance by pretending to be a missing heir. The scheme makes him fabulously wealthy. He leaves the circus, but also crosses a secretive cabal which has its own plans for the fortune. Harried by mysterious threats, the imposter uses his identical partner from the old carnival act to suffer in his place. Lots of laughs and exciting close calls follow as the unsuspecting double is drawn into a struggle with the secret organization. 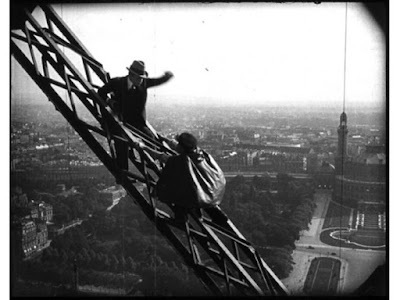 The climax is a death-defying chase up through the skeleton of the Eiffel Tower that anticipates the later work of director Alfred Hitchcock. "This is an astounding film with sequences shot high up on the Eiffel Tower and without trick photography," said Rapsis, a silent film accompanist who will improvise a musical score for the movie. "This vintage film, like a fine champagne, is a great way to celebrate the 130th birthday of this landmark, one of the world's most recognizable structures," Rapsis said. The Eiffel Tower was constructed in 1889 for the International Exhibition of Paris, during the 100th anniversary of the French Revolution, and was named after the principal engineer, Gustave Eiffel.